Innovation is the key to real and lasting progress in education, but it isn’t easy to get right. In principle, innovation allows schools to push past time and resource constraints so teachers can accomplish more with their students. But not everything pursued or passed off as innovation actually expands educators’ impact in meaningful ways. Many “innovations” have neutral or negative effects on student learning when the hassle of getting them to work outweighs the incremental benefits they offer. This is one reason why the word “innovation” often has a sour taste among educators. Take, for example, interactive whiteboards, classroom tablets, or table-top touchscreens. School and district leaders love to show off these gadgets at back-to-school nights as proof that their schools are up to speed with the 21st Century. But do these “innovations” actually expand a school’s ability to meet the learning needs of its students? The answer to that question varies based on the details of implementation. But all too often, schools use devices in ways that have only small, marginal benefits for student learning. Consider, for example, a history teacher who upgrades his classroom version of Jeopardy! so that he can present review questions by touching a screen instead of flipping over a piece of construction paper. Or consider a physics class where the teacher replaces her paper-bridge-building activity with an app that allows students to build and test similar structures on a screen. In these instances, the devices do little to reinvent the learning experience. They merely serve as expensive and complicated upgrades for their non-digital predecessors. Blended learning typically fares better than these tech-rich additions by going beyond superficial resource swaps and instead changing a classroom’s core instructional model. But if blended learning proponents are not careful, their well-touted initiatives can fall prey to this problem as well, especially when they choose to adopt what we call hybrid models of blended learning. Hybrids combine a new technology with an older technology as a way to improve the performance of the older technology. In blended learning, the hybrid models—such as Station Rotation, Lab Rotation, and Flipped Classroom—use online learning as a supplement to whole-class, single-paced instruction. Because hybrid blended learning models rely on both old and new instructional approaches, they stand vulnerable to two obstacles that dampen their potential for expanding a school’s impact. First, because the hybrid models retain many features of traditional instruction, they miss opportunities to use online learning to its full potential. When core instruction still follows a curriculum pacing guide, learning cannot be fully mastery-based and optimized for individual students’ learning needs. When teachers still carry primary responsibility for delivering content, they don’t have time freed up for building relationships with students. And with traditional grading systems intact, hybrid blended learning still reinforces performance-oriented mindsets and stymies growth mindsets. Second, hybrid blended learning models typically require more of teachers’ time and effort to make them work. Integrating elements of the old and the new adds complexity, which increases the likelihood of “technical difficulties.” Weaving together the old with the new also requires teachers to be experts at both traditional teaching and technology integration, which means more time up-front figuring out how to operate the model well. This is why hybrid models are inherently less “foolproof” than either the old technology or the new technology in their pure forms. In short, because the hybrid models remain tethered to traditional school structures, their potential for producing dramatic improvements in student outcomes face some notable hurdles. 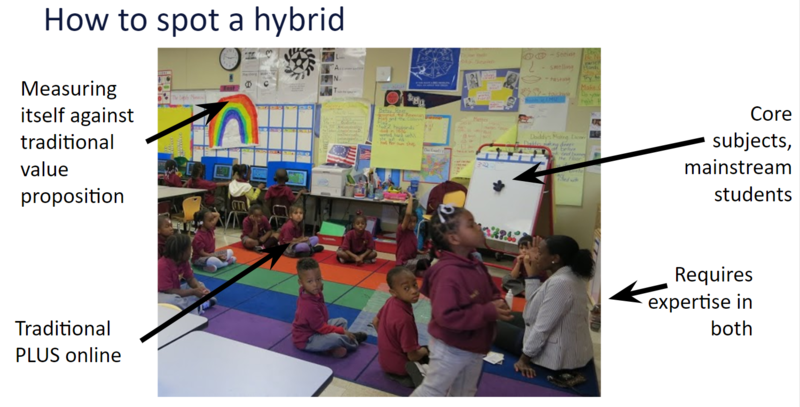 And unless educators take care to maximize the benefits of hybrids—such as better differentiated instruction—while minimizing implementation challenges with easy-to-use tools and appropriate training and support, they might find it hard to capture the benefits of hybrid models. To be clear, we’ve seen schools achieve noteworthy results with hybrid models of blended learning thanks to thoughtful planning and implementation. But the challenges noted above illustrate at least two reasons why we haven’t seen strong results across the board from schools using hybrid models. Innovation is the key to expanding a schools’ impact possibilities frontier. But blended-learning programs that add complexity and friction to teachers’ lives with only marginal improvements to offer in return, fall short of innovation’s promise. Not everything that glitters is gold, and not all innovations are truly innovative. To avoid chasing fool’s gold, school leaders need to carefully weigh how much an innovation expands the impact of teachers compared to its associated costs in dollars, time, and effort.